Joy, Pure Joy that is what weddings are, one of the happiest day’s in a couple’s life, the day they become a family, and emotions run high. I love capturing those emotional moments in photographs, when a single tear falls down a Groom’s cheek, or the Bride buries her face into her new Husbands shoulder during the first dance. I love when the little kids get down on the dance floor and are just completely lost in the moment dancing away! I’m not going to act tough either, if the right song plays during the Father Daughter Dance or Mother Son Dance, you might see me wipe a tear from my eyes, gets me every time. What primary photographic style do you work with? 7 or 10 Hours of Coverage, An Engagement Session, 2 photographers, Custom USB drive in a wooden box, your images hosted online and the copyrights to your images. Eyecaptures Photography has photographed in all types of lighting conditions from poorly lit Church Ceremonies to Outdoors at Sunset, there is no lighting scenario I have not photographed in or aren’t ready to handle. 100%, When you book with Eyecaptures Photography you are in fact booking Bryan to cover your entire day. On the rare occasion we will book two weddings a weekend, but absolutely never more than one a day. If by act of god or extreme injury or illness I am unable to photograph your Wedding, I will have someone there to photograph your beautiful wedding. I carry 2 cameras, 5 lenses, 2 flashes, light stands and umbrellas to every wedding. 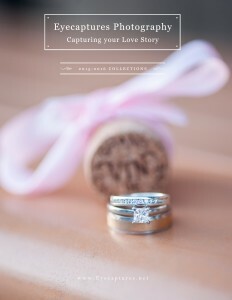 Yes, who wouldn’t want to have their amazing wedding day published on blogs and in bridal magazines! Flush mount, metallic, leather, parent, minis, all sorts.